After having finished Katie’s dress (mostly… I may have done a few things the night before the baptism) I packed up my little car and began the trip out to Utah. The great thing about these occasions and trips is time with friends and family and of course both Girls vs Bloggers in one room…working on projects and cooking food and having fun together! This trip was no different, and while many times we find ourselves so excited about getting to visit we forget to take pictures of our adventures…this time we managed to capture dinner. With two spunky girls in the kitchen (and a handful of little ones running around helping) how could dinner be anything but fantastic…not to brag or anything. So here it is…Eggplant Parmesan and a delicious fruit salad topped with a lime, honey, mint dressing. Enjoy! We began by making a trip through the pantry to see what we had on hand and then made a trip to the store to see what was fresh. 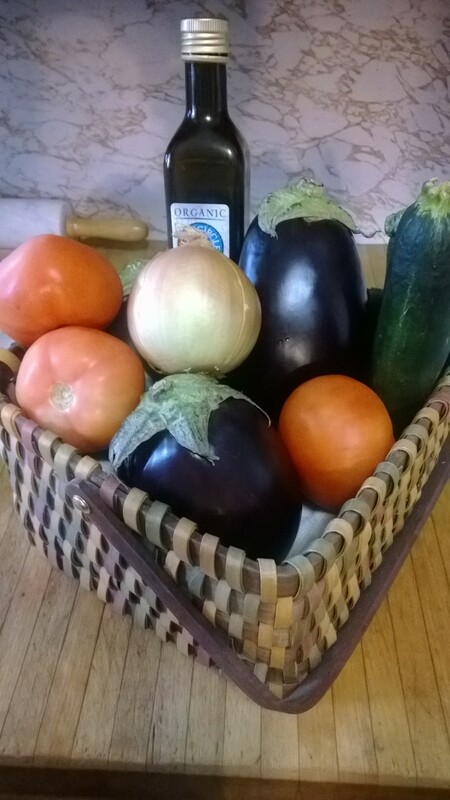 As luck would have it Eggplants were piled high, looking delicious and ON SALE! We picked up two to feed 9 people and had left overs to take next door to the neighbor. Next we strolled through the fruit section and found fresh berries were on sale…so into the basket they went as well. With a game plan in place we assessed what we had seen in the pantry at home and then picked up a few remaining ingredients like panko bread crumbs and one or two extra tomatoes (as we weren’t sure there were enough from the garden). 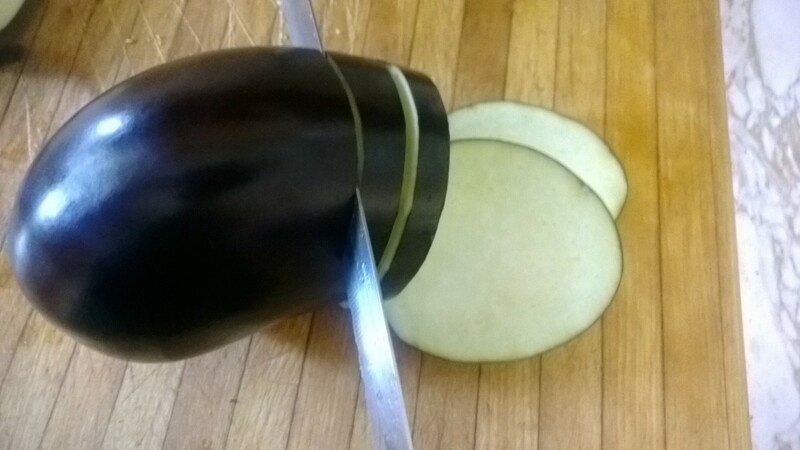 Step 2: Slice eggplant into 1/4-1/8in thick sections and place on a wire rack. Salt the slices liberally then set aside with paper towels or kitchen towels under the racks. 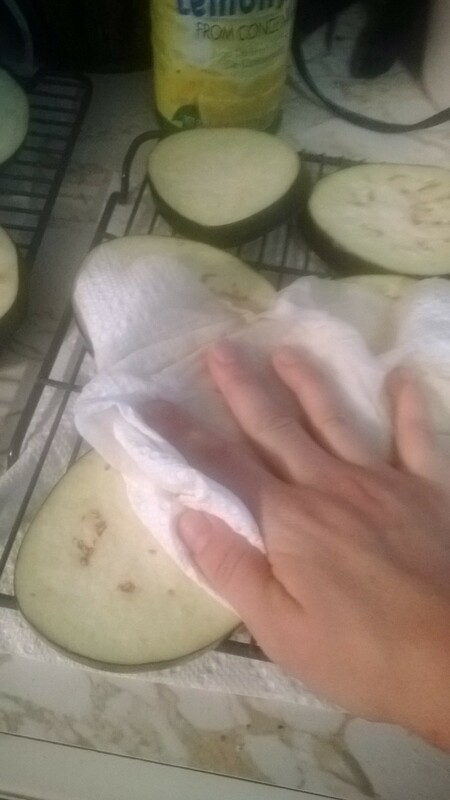 This allows the additional moisture to come out of the eggplant which keeps the outer crust crispier later and makes for more even cooking. 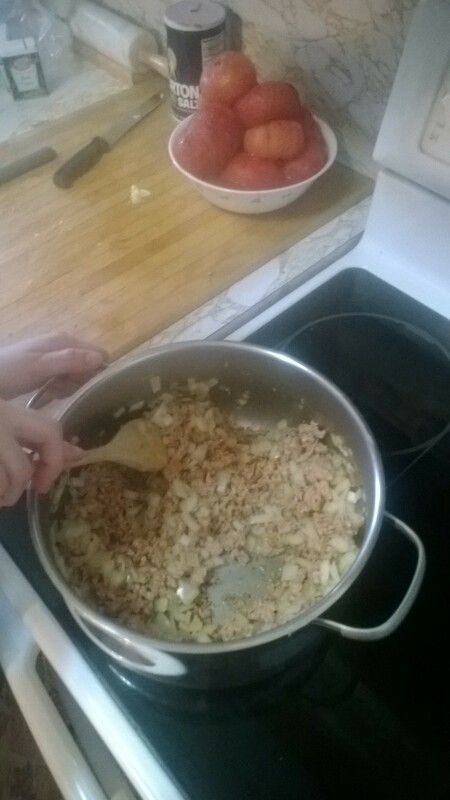 Step 2: Prep for tomato sauce. Gather your fresh picked or purchased tomatoes and place them on a baking sheet. 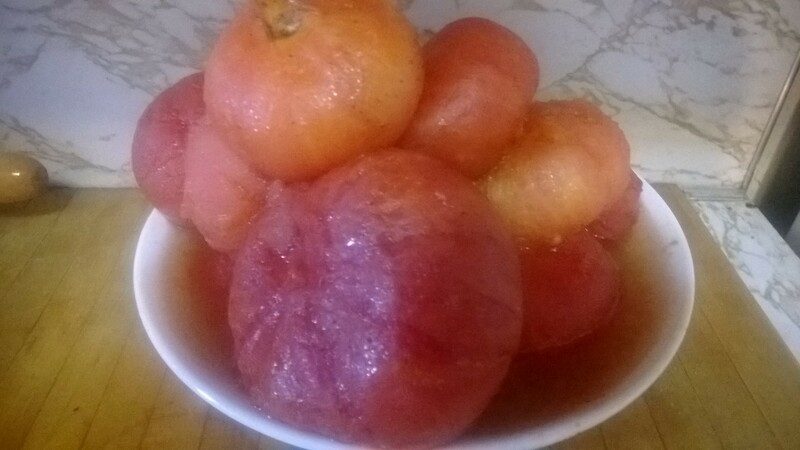 Coat tomatoes in olive oil, salt and pepper and place in a 350 degree oven for 10-20 minutes or until the skins begin to roll and peel away from the flesh. 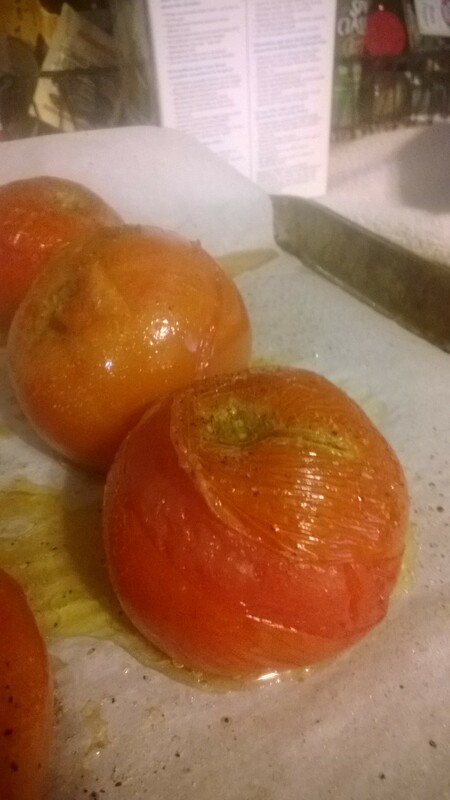 If skins can be easily removed they are done…if they are still difficult to remove and are taking flesh with them when you peel back place the tomatoes back in the oven for a few more minutes. 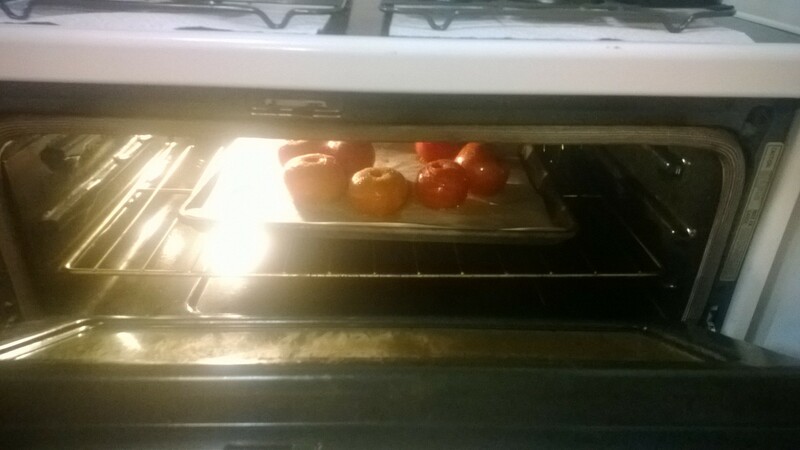 Remove tomatoes from oven and set aside to cool slightly before peeling. While tomatoes are cooling grate a zucchini (we are about to hide some super nutritious veggies in this delicious sauce. The kids won’t even know they are there!) 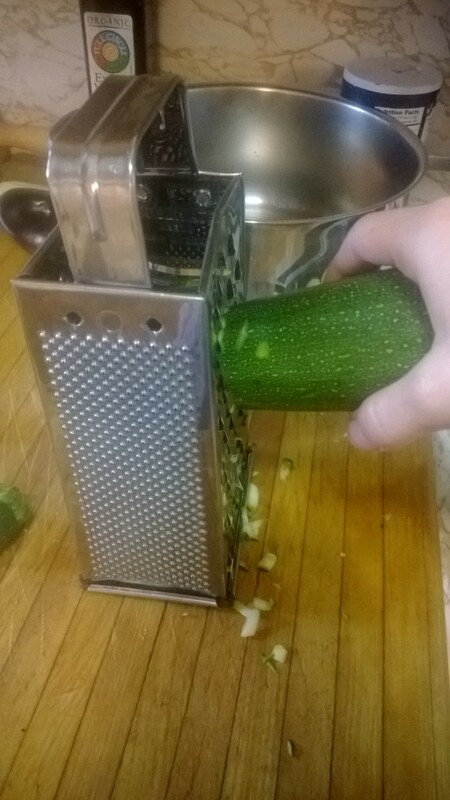 As luck would have it our girls actually like the veggies so I don’t really have to hide them…but I still like to grate the zucchini because it disperses the flavor well and thickens the sauce! Then peel the tomatoes and set aside. Step 3: Remove casing from your italian sausage of choice (we used spicy italian chicken sausage) and place it in a hot pot. Immediately begin to break up the sausage with a wooden utensil. 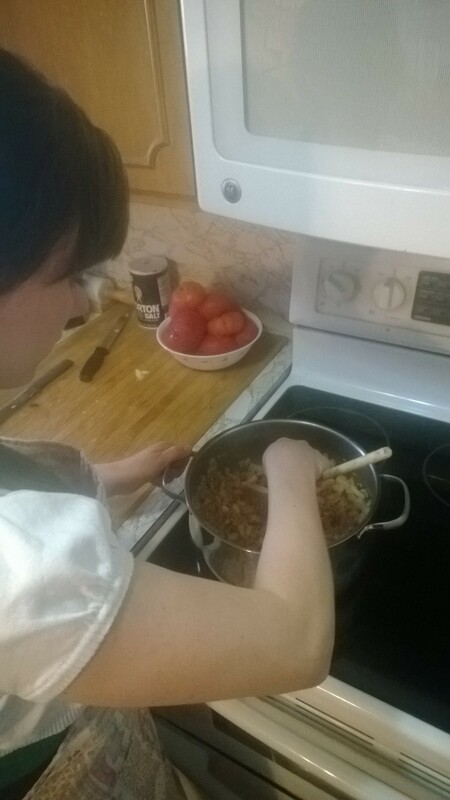 Once the sausage has begun to render its fat add one whole diced onion and saute until the onion is translucent and the meat has finished cooking. 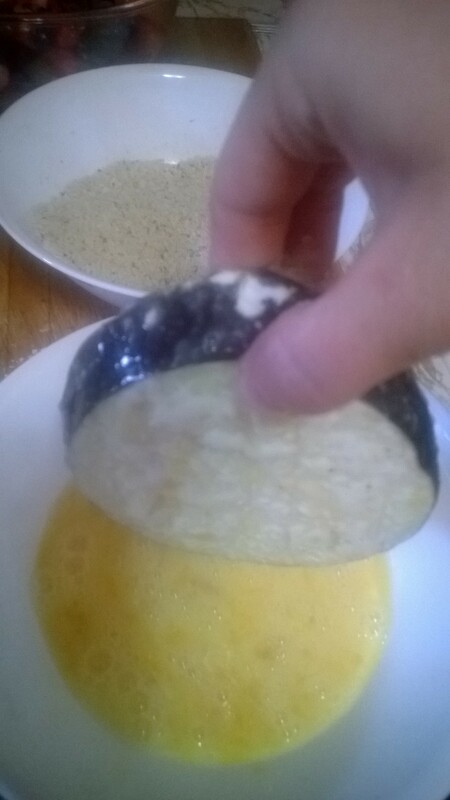 Then add 2-3 cloves crushed garlic, grated zucchini, and any other veggies you are slipping in (I also grated the thick ends of the eggplant and added them in). Sauté until veggies are soft and garlic is fragrant. Step 5: Prepare fruit salad! We added grapes, raspberries, blue berries, strawberries and banana’s. 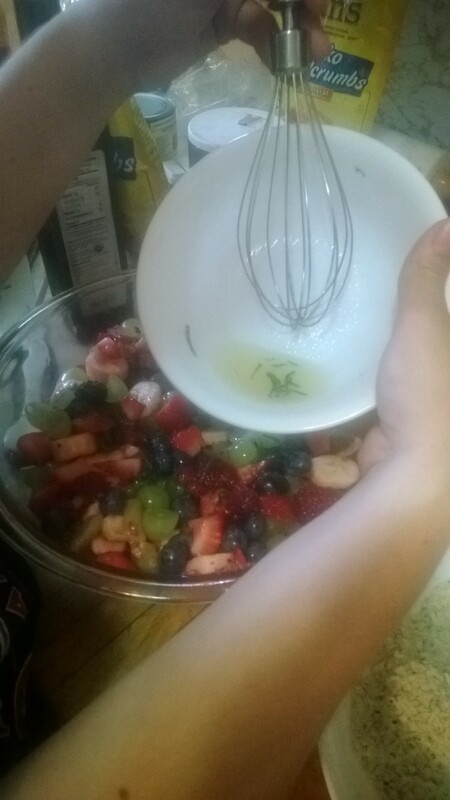 Rinse all fruit and slice the grapes in half and the strawberries into quarters. Add all fruit to a bowl and toss with dressing. Dressing = 2-3 fresh limes squeezed, equal parts honey and a splash of oil whisk together. 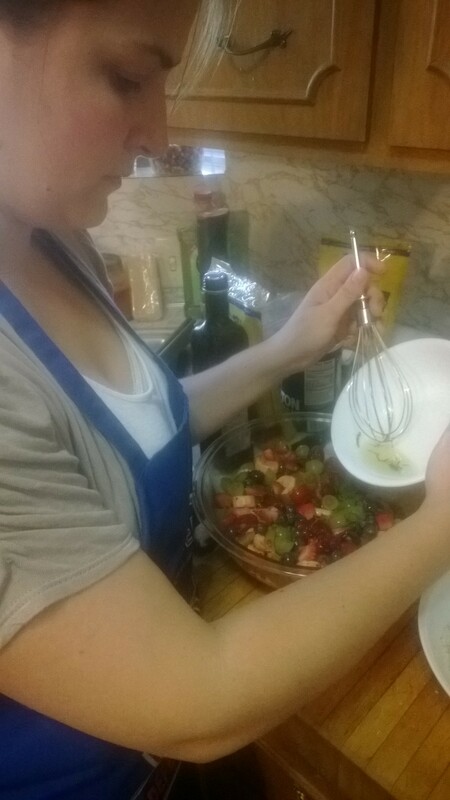 Then add freshly chopped mint leaves and whisk again before poring over salad. Toss all fruit and dressing to combine and then set aside to allow the flavors to marry while you finish dinner. 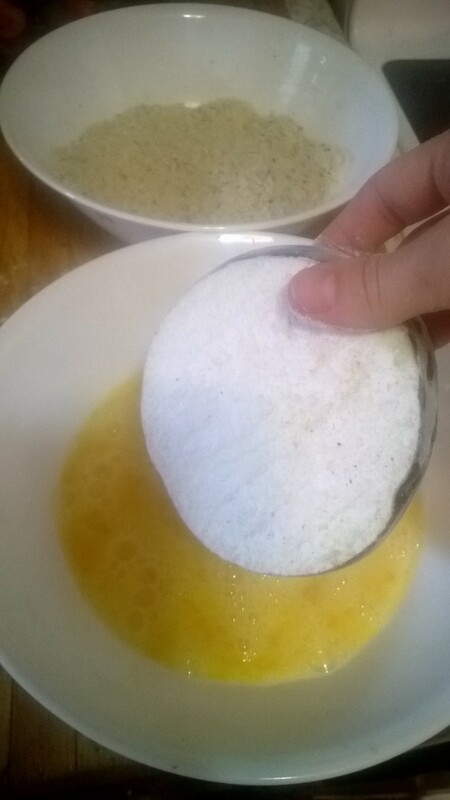 Coat in bread crumb mixture. 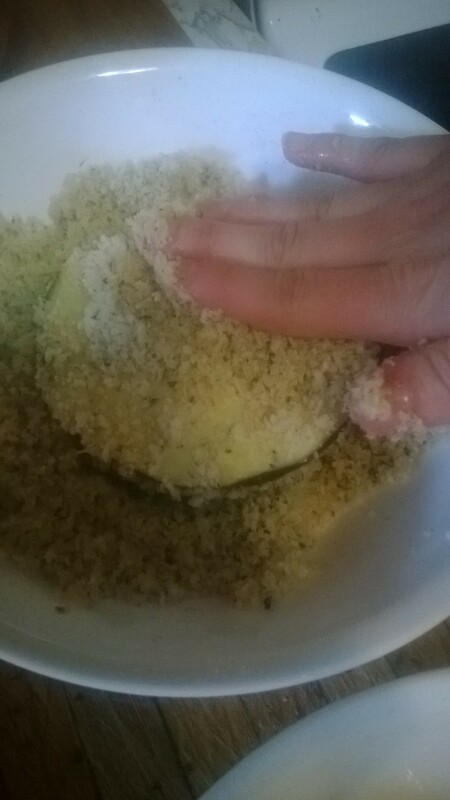 Bread crumb mixture is 2/3 panko to 1/3 traditional bread crumbs. 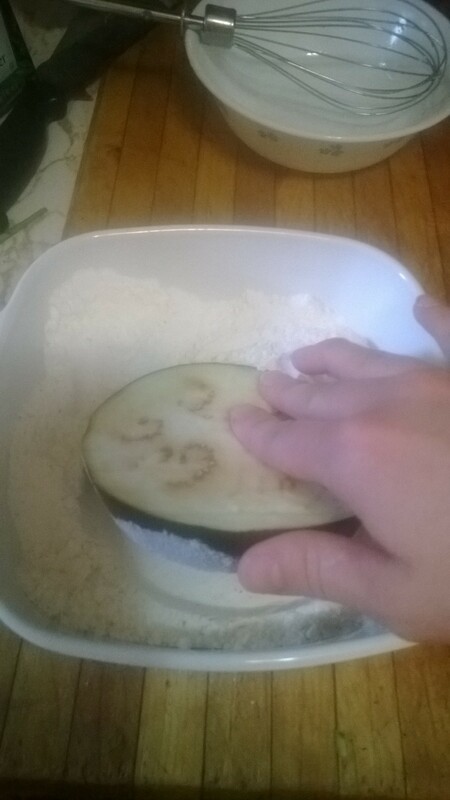 Add the same spices you added to the sauce to the crumbs so your eggplants are well seasoned and tasty; as well as a handful of parmesan cheese. 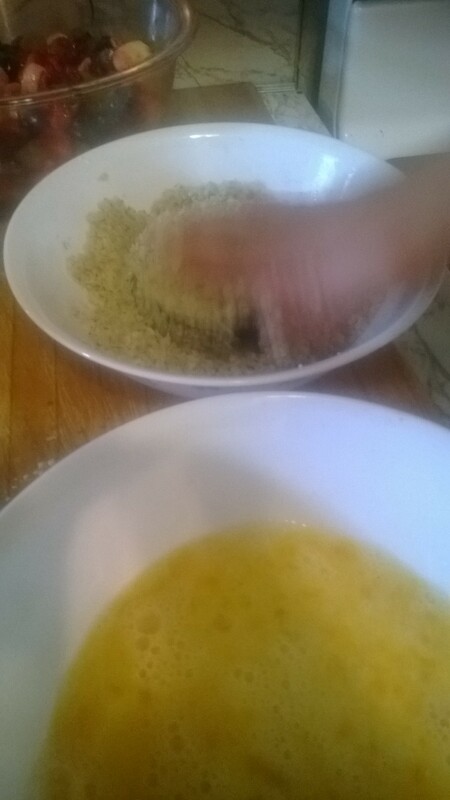 Finally add enough olive oil to make the mixture the consistency of beach sand. The reason we add the olive oil here is so we get a nice crispy crust without frying! You may need to pack on the crust with your fingers. 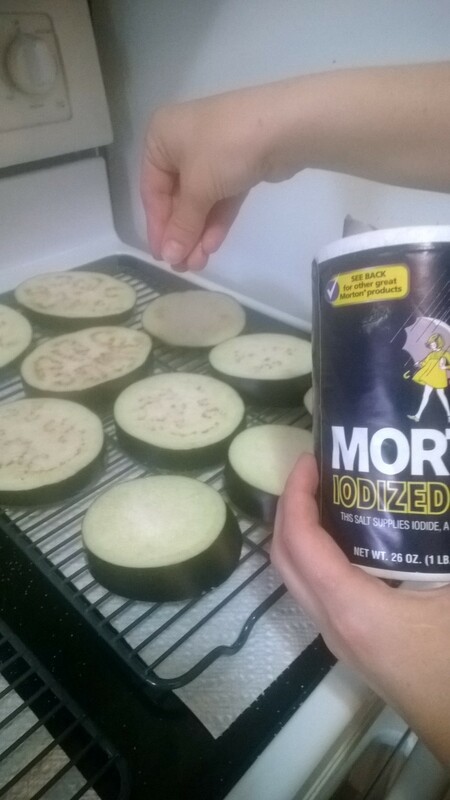 Once you have a nice even coating place onto a cooking sheet lined with parchment paper. Bake in a 350 degree oven for 25-35 minutes or until the outside is crispy golden brown and the inside is cooked through. 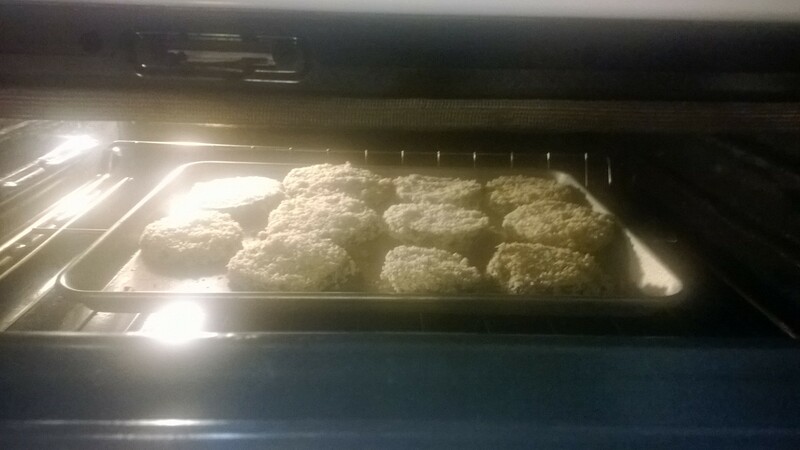 Turn once halfway through cooking to allow both sides to brown evenly. While these are cooking – make your pasta and any h’orderves/breads you wish to serve. While making dinner we gave the little girls projects so they could help with dinner too! They cleaned and set the table. Picked out which dish they wanted to use (they wanted to pull out the fancy glasses and parfait cups for this occasion), and then we had them create name cards for each person at the table. The eldest two girls wrote the names on the cards and all 4 girls helped to color and decorate them. 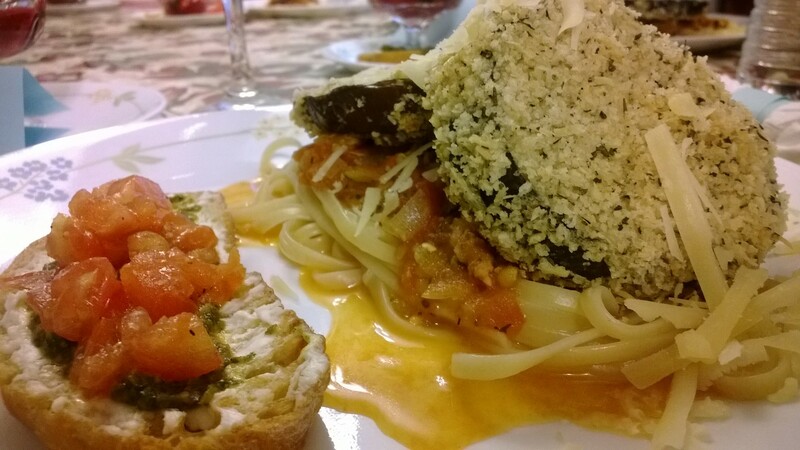 Once the eggplant is done, the pasta is ready and the table is set it’s time to plate. 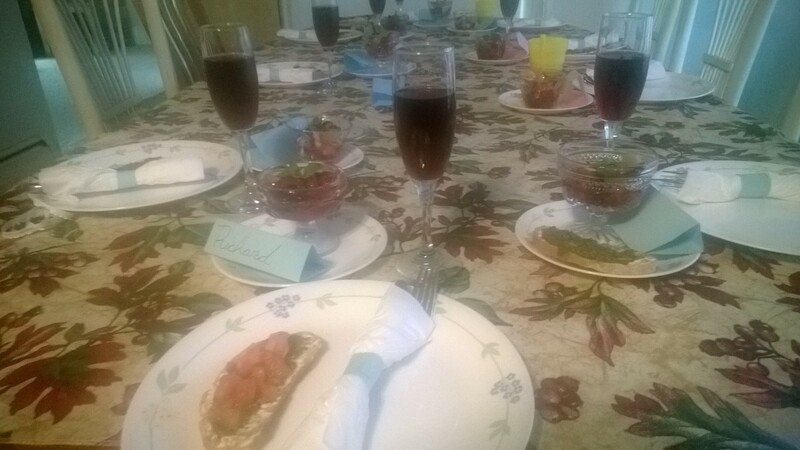 We served the fruit salad in parfait glasses as a kind of desert salad. On a main plate add pasta, tomatoe sauce and top with a few slices of eggplant. Then top everything with freshly grated parmesan cheese and enjoy!